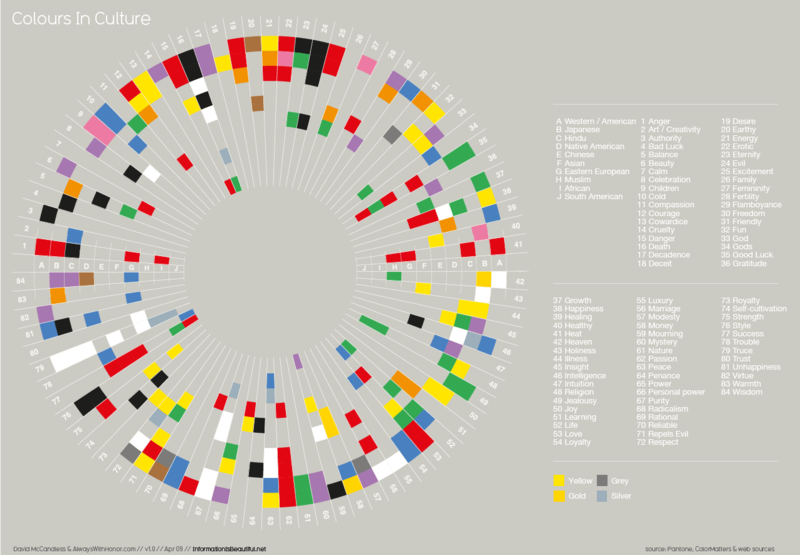 In The Science of Speaking, I wrote about both color and cultural differences, but not hadn’t yet found this wonderful graphic about cultural differences in the meaning of colors, produced by David McCandless of Information Is Beautiful. The letters represent different cultures, while the numbers represent different meanings—the colors represent themselves. By reading around a given ring of the chart, you can see the corresponding culture’s color palette. By reading down the radii, you can see which colors are used around the world for each meaning. As you design your presentations for different audiences, be sure to keep in mind these differences. While some colors and meanings are universal—for example, heat and passion are always red, others are not: while green represents life and growth in China, it actually represents death in South America.